We accept a range of payment methods. 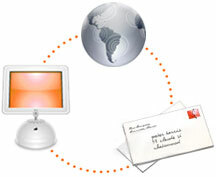 L-mail lets individuals and businesses send letters to any postal address via the Internet. We print and post letters from 20 worldwide locations and even lick the stamps for you! It's a differentiator. It's automated. It's profitable. Integrate L-Mail into your online systems. Your clients will appreciate a personal letter in this age of impersonal email. Whether you send initial welcome letters, subscription details, invoices or follow-up a bounced email, L-Mail will benefit your business. It's fun. It's versatile. It's easy. With our 20 overseas printing locations L-Mail is often faster than traditional mail...by days! Keep in touch with friends or family without e-mail. Its easy to use and fun. You can write a letter from any web browser or your email account worldwide. Simple secure payment by credit/debit cards. We print and post your letters for you. Say goodbye to queuing at the post office. It's here. It's there. It's everywhere. Write a letter from any web browser or your email account. Receive an E-mail copy of letters sent. Often faster and cheaper than airmail. No need to open an account. Send Braille and Audio letters. L-Mail accounts feature an Auto Top-up service. Auto Top-up enables us to automatically add funds to your L-Mail account when the balance falls below the specified trigger. L-Mail accounts include access to over 500 letter templates. If your lost for words or would like some help to gain some inspiration for your next piece of correspondence L-Mail can assist. If you are looking to mail a PDF document, please take a look at our sister site, www. docsaway. com. Like L-Mail, Docsaway prints and posts letters from multiple global locations so your letters arrive faster and cheaper when compared to traditional airmail services. This iframe is used to update the ticker stream.